You may not mean to pour 1/2 cup of dressing on your salad, but if you're not careful it can happen. Do you really need 300 calories worth of goo on those greens? Nope! Instead, invest in a set of handy little vented pourers, and it'll be easy to dispense small amounts of your favorite bottled liquids and dressings. Find these anywhere kitchen supplies are sold, and at Bed, Bath & Beyond. Need to coat a pan or baking dish? Want to saute your veggies in just a teensy bit of olive oil? Good luck! With quarter-sized bottle openings, oil seems to gush out in buckets. 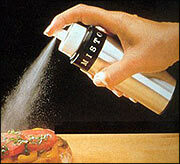 So invest in a Misto Olive Oil Sprayer. We love this thing! You can also use the Misto to spray bread with just a touch of oil, instead of dunking it in the fatty goop. Misto will be your new best friend (but will never ask you for a ride to the airport). Who eats only one "serving" of popcorn, chips, cookies or pretzels? If you're like most people, the real serving size of a snack item is the WHOLE bag. The best way to avoid falling into the "I might as well finish the bag" trap, is to buy individually wrapped serving sizes. Unfortunately, some foods only come in large-sized bags. Don't despair! Use a Eurosealer to separate foods into individually-wrapped single serving sizes. Not only will it help you with portion control, but you'll also have sealed healthy-snack baggies handy for when you're on the go. 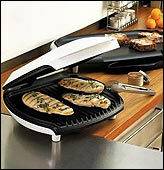 Unless you live under a rock, you've heard of the George Foreman Grill. Turns out, this great little grill is just as good as George says it is. Just slap some boneless, skinless chicken breasts, lean hamburger or trimmed steak on this baby, and watch as fat and grease collect in the cute little fat-trapper! Added Bonus: Looking at the nasty, lardy cup of gunk may help motivate you to avoid other fatty items! Today, March 16th, is National Artichoke Heart Day. Artichokes are excellent for your heart, and they contain lots of fiber, magnesium, folic acid, and a nice blast of vitamin C! Share these "thin-a-majigs" with people you enjoy. Click "send to a friend" NOW!